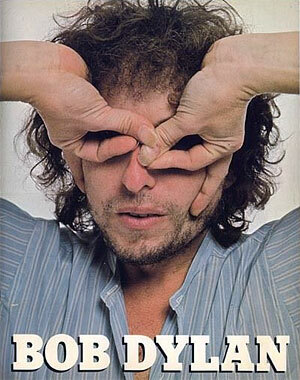 So it was that on 1st April 1978, I saw Bob Dylan for the first time. The concert was held at the Sydney Showground which, after several days of exceptional rainfall, was like a mud pit. The eight-piece band started off with an instrumental version of A Hard Rain’s A-Gonna Fall which I didn’t recognise until my friend Ian exclaimed the title. This would set the tone for what was to follow. Dylan had only fairly recently begun the process of reinventing his repertoire by changing the arrangements and even the melodies of his well-known songs. While this seemed shocking at the time, listening now (check out Bob Dylan At Budokan recorded the previous month or the bootleg from the Adelaide show two weeks earlier) it was tame compared with what would come in the years ahead! Spoilers – If you follow my story to the end you will accompany me to no less than nine Dylan concerts and, while all had their merits, it was the seventh one that fulfilled all my expectations and the ninth that showed him in top form at the age of 73! 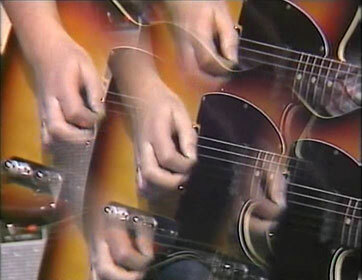 Being back in Australia in 1978 with the confidence that I could now make a living as a full-time musician was one thing, but I had to continue along that path and re-establish my contacts in Sydney. I bought a second-hand Datsun 1600 car, bought a new guitar amplifier made by Pearl that was uniquely built in to an aluminium flight case, joined the Musicians Union and advertised in the local papers. I also got in touch with Reg Lindsay and Heather McKean but found they already had a full band, The Overnighters, which included Phil Emmanuel on lead guitar. Phil, known in the business as ‘The Wiz’ because of his fingerboard prowess, was even then an established local guitar hero. He and his younger brother Tommy had started as children with their family band ‘The Midget Surfaris’ and later risen through the ranks of the national touring circuits, accompanying countless country music stars. Reg and Heather were happy to hear from me though and suggested that I get in touch with the female singer that presently toured with them and needed a guitarist/musical director when she made solo appearances outside of their show. 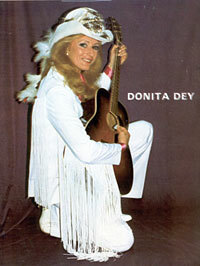 Her name was Donita Dey and on 14th April 1978, I returned to the Australian stage at Lithgow Workers Club playing guitar for her and also the star of the show, singer Jay Justin. The show on the next night at Oberon RSL Club also included Buster Noble, the legendary vaudeville comedian (and father of sixties singing star Patsy Ann Noble). A weekend later I played a Sydney club date as part of Bill Kelly’s ‘New Country Ramblers’ band, finally working with the great gentleman Bill who had recommended me to others a couple of year earlier. Next stop was to drive to Queanbeyan to play four shows at Walsh’s Country Music Pub for Donita Dey. All seemed to being going well, but on the last night, driving from Queanbeyan to Canberra, I hit a gravel patch in the dark and the car did a spin, which wouldn’t have been so bad except that it slid to rest against the edge of a ditch with just enough momentum to flip over on to the passenger side! I climbed up and out the driver’s side shaken but unharmed and Donita followed likewise, except for collecting a knock on the head from the car door which wouldn’t stay open in that position. Back in Sydney I played some dates with my old mates in the Country Road band, more shows with Donita and then one with singer/entrepreneur Terry Gordon that included vocalist Elizabeth Garnett and comedian Tommy Mack (brother of hillbilly legend Tim McNamara). This was followed by a four-day tour with Terry, Buster Noble and singer Donna Black. Terry, ever the joker, organised a gag one morning with the help of a motel owner. Knowing that Buster had ordered fried eggs for breakfast, he organised for them to be substituted with realistic-looking joke rubber eggs. Breakfast was delivered on a tray through a hatch in to Buster’s room and we waited for the yell, cursing and laughter that notified us that he had tried to cut in to his eggs! Terry and I hit it off musically and I played quite a few shows with him, sometimes just the two of us, and he also introduced me to his friend Neville Palmer (known as ‘Whiplash’) who had a band named Buckskin down in Wollongong (not to be confused with the Sydney band of the same name). 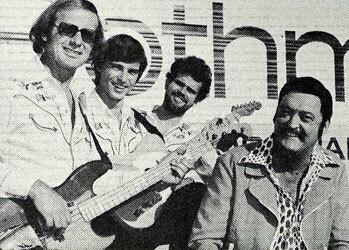 I became a regular picker for Neville’s band for a while and played at many of their residencies that included the Wollongong Hotel and Sunday afternoons at the Shellharbour Inn. Soon I heard that Phil Emmanuel and bassist Rob (Casper) Brown were planning to leave the Reg Lindsay show to form a rock band named King Dog with vocalist Gillian Eastoe and meanwhile, drummer Don North was also departing. Reg and Heather asked if I would be available to join The Overnighters band as Phil’s replacement and I recall going to one of the boy’s last gigs and making Phil laugh as I stood near the front of the stage and pretended to be taking notes every time he played a solo. 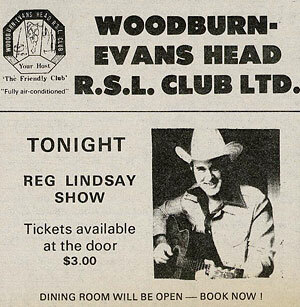 Eventually on the 22nd July 1978, I played at the Grafton Showground as a full-time band member of The Reg Lindsay Show, which also featured spots from regulars Heather, Donita, steel guitarist Pee Wee Clark and on this occasion, Reg’s contemporary, and fellow Australian country music pioneer, Kevin King. Meanwhile singer Nev Nicholls, who had maintained a great residency at the Texas Tavern in Sydney’s King Cross during the days of the American soldiers visiting on R&R leave from Vietnam, was also asking me to join his great band, The Country Playboys which included the talented Gary Brown on guitar and Allan Tomkins on bass (these days I play instruments handmade by the very same Allan Tomkins). 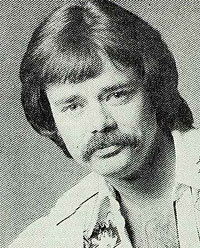 The Nev Nicholls Roadshow was enjoying popularity on the back of his truckin’ themed records. I did play one date with them at the Texas Tavern, but then Reg’s offer became more serious with a 15-day tour of Northern NSW, immediately followed by four days heading south ending in Victoria and much more to follow. The Reg Lindsay tour didn’t quite go completely smoothly. On 9th September we were trying to get from Evans Head to Goondiwindi. Reg & Heather are in a big American car and I was following behind in my old orange Datsun 1600. 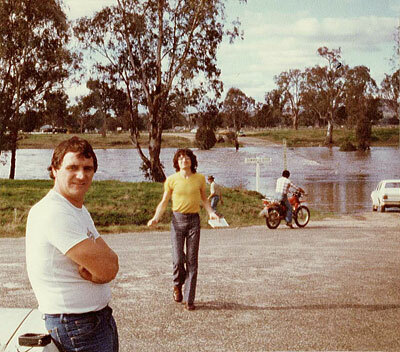 The Dumaresq River has stopped our plans and in this photo (left) bass player Michael Vidale is coming back from the water with the news that we might as well turn around. Comedian Danny Fletcher watches on while listening for news on a transistor radio. Reg was distraught, having hardly ever missed a show in his long career. Pee Wee Clark and Alan Hockley got through just a short while ahead of us though and played a pedal steel and drums duo gig for the Goondiwindi RSL while we stayed somewhere overnight and re-joined them at Tenterfield the next day. Michael was only signed on for that one tour but we have remained fast friends ever since and have worked on many performing and production projects together. After that tour, Heather resumed playing bass as she had done for many years earlier until soon it was discovered that Pee Wee’s young son Mack was growing up as a musical prodigy and he became our regular bass player. Countless shows followed, some more memorable than others. With Donita, Geoff Mack and Jim Clifford, I played at the Silverwater Women’s Detention and Training Centre with the notorious ‘drug grannies’ in the audience. Geoff ‘Tangletongue’ Mack (who you might remember I first met in 1973) also hired out his mini-bus for us to tour in on occasion. With Reg’s show we played three nights at the House On The Hill nightclub in tropical Cairns, formerly a training school for Special Operations Commandos during World War 2. This trip was made notable because Alan Hockley and I took a boat trip over to Green Island and I had my very first experience of snorkelling at the Great Barrier Reef. We finished our show in Cairns at 11pm each night only to find that our rooms were directly above the disco, which thumped on to 3am each morning. I found a worn copy of the LP Jazz Waltz by Les McCann and the Jazz Crusaders for $1.50 in a local pawn shop and I still love that album. A few weeks later the House On The Hill was in the national news when a visiting group of footballers wrecked the place and many years later it burnt down. Now I was really busy, fitting shows with Terry Gordon, Buckskin and Donita, in between Reg’s shows which included headlining the Yooralla Country Truckin’ Days at the Royal Melbourne Showgrounds (featuring a who’s who of Melbourne acts that I would be working with before too long) and the opening of the unique Kallangur’s Hotel-Motel on Brisbane’s north coast that was named Space City. We also played everything from the National Rodeo Finals at the Toowoomba Showgrounds to the Masonic Convention at the iconic Sydney Opera House. What a thrill to be playing there in the fabulous Concert Hall, remembering to play quietly as the acoustics weren’t exactly designed for electric guitar! As well as playing Reg’s own segment, we were also a part of the finale with the orchestra conducted by Maestro Tommy Tycho and featuring acclaimed soprano Suzanne Steele. 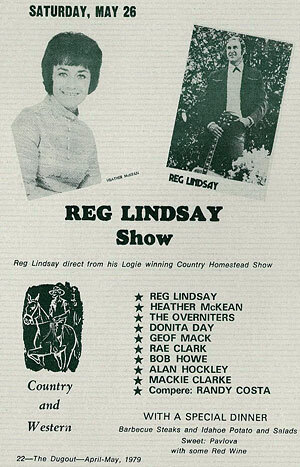 Reg had much success in the sixties with his own TV series, The Reg Lindsay Country Hour filmed in Adelaide and broadcast in black and white. 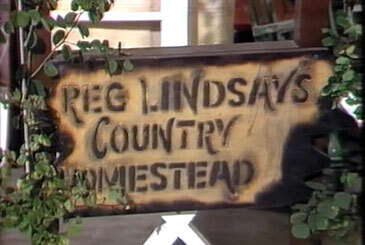 From 1977-1980 his second series, Reg Lindsay’s Country Homestead was filmed in colour at QTQ 9 studios in Brisbane. For a while after leaving Reg’s ‘live’ band, Phil Emmanuel continued to play on the TV show or sometimes his brother Tommy Emmanuel would fill in for him. Eventually this job was handed over to me in October 1978 and I flew to Brisbane with Reg, Heather and Pee Wee for what was to become a regular fortnightly experience. We would tape two shows in one day with the same guest artists but they were eventually broadcast in a different order to disguise the duplication of singers. If we travelled up in the morning we would then stay overnight, but more often than not we would fly up and stay the night before and catch the last plane back after finishing the two shows. Reg was a very ‘up’ kind of personality, living on his nerves and this made for some very tense dashes to the airport. He was under a lot of pressure. I can recall one time after just missing a flight which, being relatively placid I took in my stride, Reg got very annoyed with me. “Doesn’t anything upset you Bob?” he shouted across the terminal! The delays at the television studios always seemed to be technical. No matter how early we started in the morning, it always seemed to take all morning to get the first segment set up and filmed. That meant that after the lunch break we had to go full speed to finish the first show and completely record the second hour’s worth of songs. 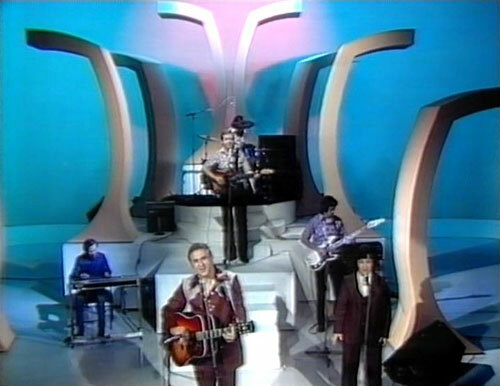 The segments included two or mostly three songs and they were filmed as a block. If a serious enough mistake was made we had to film the entire segment again. Musically we were an experienced bunch who knew how to keep our cool so for our part we rarely made any unrecoverable errors. Directing the band and playing the acoustic guitar was Garry McDonald (not to be confused with the comedian of the same name). Vern Thomson played the upright piano and Darcy was on the electric bass. 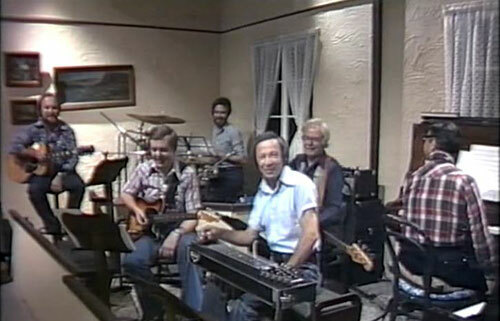 Pee Wee played pedal steel guitar and Don Lebler (who had played in Axiom and The Mixtures) was on drums. Occasionally there were backing vocalists, although normally off-camera. Even though I was ‘the new boy’ they made me very welcome and I learnt a lot from all the guys in the band. Each show would open to sound of Reg’s tune Twinkle Chimes and a filmed sequence that involved Reg riding a horse up to the front door of ‘his homestead’ (actually a borrowed house). The interior sets were convincing enough except for the tell-tale white studio floor, regardless of whether it was supposed to be indoors or outdoors. 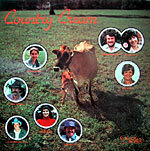 Many times I would be in a taxi heading to the studio and the driver would remark, “That’s a lovely homestead Reg has got up there!” The first show I played on eventually screened on TCN 9 in Sydney on 14th April 1979 and as well as Heather and Pee Wee, it also featured the legendary Chad Morgan, Sylvia Raye, Barbara Thompson and Greg Anderson (minus the horse that he was famed for riding in to night clubs). At that time the latest ‘hip’ sound was a syn-drum, one of the first electronic drums, and Don Lebler used it tastefully alongside his regular kit in the TV studio. Chad Morgan, the legendary hillbilly star, heard the sound and wanted it on one of his songs. Since he performed with just a guitar and without the band, that created a dilemma. Chad was insistent so a compromise was reached. Reg introduced him on camera, Don gave on big hit on the syn-drum and as the distinctive sound faded away, Chad launched in to his number, much to our merriment. 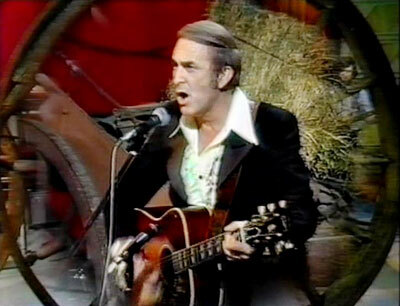 The live shows continued and as Reg Lindsay had the best profile of the ‘modern’ country singers in Australia, being in his band gave me a certain amount of attention as a guitar player as well. 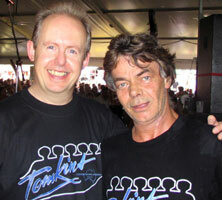 In particular, the guest stars from Sydney who appeared on Reg’s TV show, began to hire me for various live concerts. In between Reg’s dates, Donita shows and Buckskin band jobs, I was also playing occassional shows with Emma Hannah, Roger Thwaites, Johnny Ashcroft and Gay Kayler, and Cowboy Bob Purtell. There were many other guests who I would work with a lot in the years to come, including several of the ‘Stars of Bandstand’, the popular Australian musical/variety television show of the sixties. There were also guests that I knew from my folk club days and my time at Festival Records, which in the case of the marvelous Doug Ashdown was both. In May 1979 John Williamson was a guest and I got to play behind him on my favourite song from his Road to Town album, I Still Cry. Graeme Connors was a guest in September and I remember him singing a version of Paul McCartney’s Heart of the Country which was musically more sophisticated than most of the material we presented. Graeme would soon have major songwriting success writing for Slim Dusty before recording his breakthrough album North. Reg at the front, Heather McKean front right. Pee Wee Clark on the left and Mackie Clark on bass. 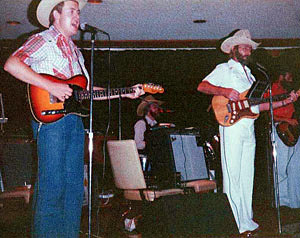 Bob Howe on lead guitar in the middle and Alan Hockley (obscured) on drums. 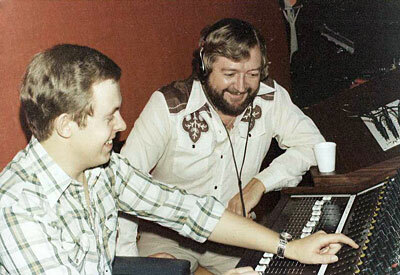 While all this was going on, Terry Gordon invited me to produce an LP for him and between February and April 1978, we managed to squeeze in quite a few sessions at Soundlab Studios in Sydney with owner Roy Cooper engineering. Between us we assembled a great team of musicians; Pee Wee Clark on pedal steel guitar, Kenny Kitching on pedal steel and dobro, George Boyer on piano, Allan Tomkins on bass and banjo, Alan Hockley on drums, Desree Crawford and The Singing Kettles (Ross & Bill) on backing vocals, while I did triple duties playing guitar, harmonica and keyboards while arranging the songs and ducking in and out of the control room to produce. The album was a labour of love for many of those involved, in particular Roy Cooper who spent many a late night in his studio with me. The tracks were a mixture of American and Australian songs and I wanted to unify them somehow by relating them to Terry’s persona. Inspired by recent concept albums by Willie Nelson, including Red Headed Stranger, I wrote a short opening and closing theme based on the title of the LP, The Last of the Marrickville Cowboys, plus a couple of instrumental reprises to round off the idea. 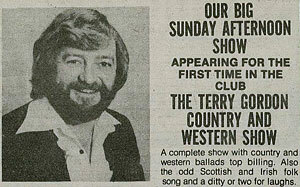 At the time Terry lived in the inner-west Sydney suburb of Marrickville. 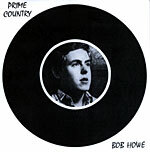 The title turned out not to be prophetic as three decades later, the country-music scene in Sydney still thrived in that area. Around this time I met Eric Watson, outspoken country music author and historian and the owner of the Selection Records label. It turned out that Eric was living literally over the fence from me in Eastlakes. Although our apartment buildings were in adjacent streets, they backed on to each other and I could cut through a gap in the fence to visit him. He was a champion for traditional Australian country music and had no time for local acts using American accents or being overtly influenced by the modern Nashville sound. At first Eric hired me as a session musician and amongst the first recordings I played on for him at Axent Studio were tracks by Johnny Ashcroft and Gay Kayler that were eventually released on a compilation LP called Country Cream. 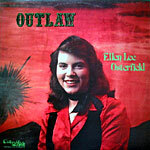 Next was an LP by young Bendigo songbird Ellen Lee Osterfield entitled Outlaw and produced by Carl Myriad. To round off the year I played on three quarters of the LP Salute to the Roll of Renown. Back then, there were only four inductees to salute, so Gordon Parsons sang a tribute to Tex Morton, Eddie Tapp paid tribute to Buddy Williams (both recorded at Axent) and (at Soundlab) I produced Johnny Heap singing the songs of Smoky Dawson. The other quarter was Reg Poole singing Slim Dusty complete with the fretwork of Slim’s guitarist Barry Thornton for a true authentic sound. In March we recorded two nights from ‘The Barn’, a country music room that was part of the Waterloo Hotel in Brisbane’s Fortitude Valley. The line-up was excellent and included Doug Ashdown (pictured left in front of the band), Laurel Lee, Lonnie Lee, Greg Anderson and Johnny Robson, along with the regular crew of Reg, Heather, the band and Nev McLachlan’s Bar K Circle W Square Dancers! 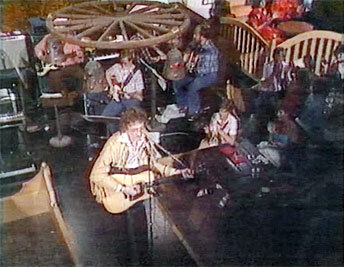 Recording in front of a live audience really gave an added dimension to the proceedings and it showed on the broadcast. 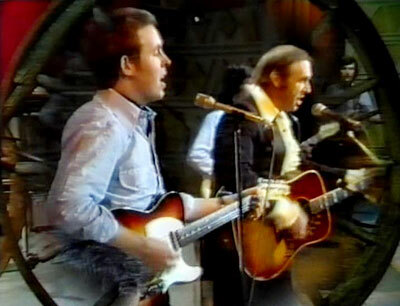 In 2018, several of these songs by Reg and Doug were included on the DVD ‘Reg Lindsay – Country All The Way’. Later in October, the second last recording I took part in, was filmed live in Brisbane’s City Square as part of the annual Warana Festival which ran every spring (and later transformed into The Brisbane Festival). 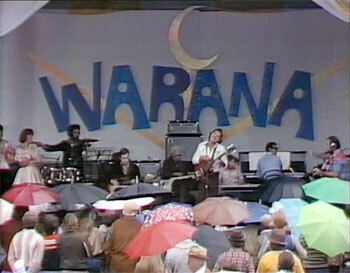 Warana is an aboriginal word for “blue skies”, but that was hardly apt in 1979. The audience braved the wind and rain as they stood in the square under umbrellas and we gave our best, despite the constant threat of electricity mixing with the downpour of rain. I remember the stage being swept of excess water in between songs! Again the guests were a cut above the norm with the indefatigable Ian Turpie (pictured right) giving a great rendition of Jerry Reed’s (Who Was The Man Who Put) The Line In Gasoline, plus Roger Thwaites, Emma Hannah, John McSweeney and banjo wizard Chris Duffy. Eventually I became frustrated with the regular touring concerts and felt the band never got to fulfill its true potential. Reg was an excellent guitarist and backstage I would witness him playing some intricate fingerstyle tunes. On stage though, he had the rather over-exuberant habit of playing along with everyone else’s solos – usually at a much louder volume – and this negated any subtlety in the musical arrangements. I was also beginning to enjoy the variety outside of the show, so I gave my notice, having performed over 70 live shows as an official member of The Overnighters and having appeared on over 40 episodes of the television show. I was already closing every gap in my diary by filling in with a dozen different bands and shows and this continued for quite some time. One of those nights would prove to be very fortuitous. I was playing at Doyalson-Wyee RSL Club with Ian Betteridge and the Ramblin’ Country Band which included ‘Hollywood’ Dave Webb on steel guitar. The guest artist for the night was Mick Hamilton, who I had backed previously on Reg’s TV show. Mick had a fine voice (with a touch of Conway Twitty growl) and along with his excellent guitar playing he highlighted his act with some energetic Cajun fiddling. As we were both heading back to Sydney after the show, we arranged to meet at a late-night roadhouse for a cup of tea (true!). As we chatted, Mick explained that he was also working as guitarist and musical director for both Lucky Starr and Laurel Lee, but he really wanted to concentrate more on his work as a front-man. He suggested I might be interested in taking over some gigs for him and indeed, the very next weekend I found myself playing for Lucky Starr (the start of a long association) and the following year, also the wonderful Laurel Lee.